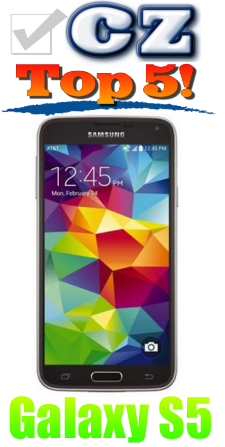 Okay folks, Samsung has announced opening day for pre orders on the AT&T version of the Galaxy S5 smartphone! Let's take a look at the top 5 reasons that you should consider grabbing an S5 hot off the presses and be the first to get your hands on one when they ship. 1) Standard Price Point - The Galaxy S5 will be available for the standard contract price of $199. Sure, the price will drop over time, but why wait and end up with a smartphone that is going to become obsolete? If you want the cutting edge, get on the edge now. It's not worth waiting several months just to save fifty bucks, more or less. This phone is packed with blazing fast hardware, and tons of new gadgety features. 2) Fingerprint Sensor - Like Apple's iPhone 5S, the Galaxy S5 will come standard with a fingerprint scanner for unlocking the phone. The scanner is built underneath the actual display, so it doesn't take up any space and make the unusable portion of the phone any bigger. I would find high use of the sensor, because unlock patterns are a pain in the rear. I normally turn off the security for this reason, and that's a dangerous thing to do with a smartphone. They've really stepped up the ease of total security with this feature. Well worth the effort! 3) 16 Megapixel Camera - The new camera on this phone breaks records again. Sure, there are other models with ridiculous cameras like the 41Mp lens on the Nokia Lumia. But this is the best possible camera you can have on a smartphone without adding ridiculous bulk. Plus the new features that are packed into camera functionality are seriously enticing. They knocked it out the park with this camera, again. 4) Super Fast Processing Power - The Galaxy S5 will set you on the cutting edge of speed with its 2.5GHz quad core processor. For the non-techies, this just means that you will be able to open applications with blazing speed, and multitask apps without dragging down the phone. Everything speeds up when you have a powerful processor like this. Add in 2Gb of RAM, and you won't be sitting and waiting much at all to perform any function on this smartphone. 5) Awesome Display - They've upped the quality of the display yet again with a 5.1" full HD Super AMOLED screen that has 1080 by 1920 resolution and 432ppi pixel density. That means brilliant colors, deep black color, amazing contrast, and viewing that can give you enjoyment like watching an LED TV. Samsung has always brought their "A Game" with the display. This one continues to impress like all previous models. Why settle for less? Sure, there's plenty more that I could drone on about. But this is enough to kick you off the fence if you are trying to make a buying decision. Chances are, you won't be disappointed with this device if having the best is what you want. All gadget nerds (like me) should be solidly satisfied with what it has to offer. This is no mediocre incremental upgrade from the Galaxy S4. It will run faster, download data quicker, and tease your eyes with its brilliant display, all while giving you plenty of added features and options to give you the best smartphone experience possible. So there you have it! 1) No Text Reflow - Want to be able to zoom in to see text with ease, but without panning side-to-side? You're not gonna be able to do that with the Galaxy S5 stock browser. 2) Must Use After-Market Browsers To Read - Tired of panning on smartphones when the text is not reformatted to fit the screen? You can download an after-market browser. But that means you don't get to use all the new gadgety cool tricks and features that the stock browser provides like tilt scrolling, eye scrolling, and touchless gestures. Pure stroke of stupid if you ask me. 3) The Text Reflow Is M.I.A. - How do you like pounding your head on the table after trying to read tons of text on your smartphone? You better get a helmet and get used to it if you buy a Galaxy S5 this spring. 4) Lack of Text Reflow - How bright are the Samsung enginerds to throw in everything but the kitchen sink into the stock browser... EXCEPT TEXT REFLOW? Ya got me, partner. If they could only dumb them down to include the most obvious advantageous function of the browser, that would be nice. But I guess they aren't HTC engineers. 5) Text Reflow No-Show - We complained when the Galaxy S2 didn't have it. We passed rumors about it coming with the stock S3 browser before it came out, and were sorely disappointed. Then we groaned and pounded our heads when it was left out AGAIN on the fabulous Galaxy S4. So if you're holding your breath waiting for it to be included on the Galaxy S5, plan on turning blue. So there you have it folks! If this doesn't prove that the Samsung enginerds are stupid, I don't know what does. I guess you can tell that this text reflow thing really chaps my buns. Hopefully that has been made obvious here. I've stuck by Samsung thus far, and it is by far the best smartphone on the market... in my opinion. But if someone releases a device that can out perform and function as well as the Galaxy S5 when I'm due for an upgrade, it's bye bye Samsung for me.